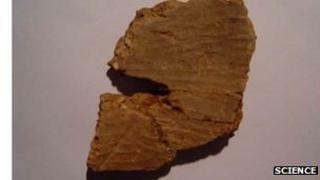 The oldest known samples of pottery have been unearthed in southern China. The US archaeologists involved have determined that fragments from a large bowl found in Xianrendong Cave, Jiangxi Province, are 20,000 years old. The discovery, published in the journal Science, is the latest in recent years that have pushed back the invention of pottery by 10,000 years. It is thought that the bowl was a cauldron to cook food, or possibly to brew alcohol. Until recently, the majority view was that pottery bowls and drink receptacles were invented after the emergence of agriculture, when people began to stay in one place for long periods. Part of the reasoning was that pottery items are large and breakable, and so not a useful technology for hunter-gatherer societies that moved from place to place in search of food. But in the past 10 years, researchers have found instances of pottery pre-dating agriculture. One possible reason for the invention of pottery is that 20,000 years ago the Earth was the coldest it had been for a million years. According to the lead researcher, Prof Ofer Bar-Yosef of Harvard University, pottery cauldrons would have enabled people to extract more nutrition from their food by cooking it. "Hunter-gatherers were under pressure to get enough food," he told BBC News. "If the invention is a good one, it spreads pretty fast. And it seems that in that part of southern China, pottery spread among hunter-gatherers in a large area." Prof Gideon Shelach of the Hebrew University in Jerusalem speculates that there may also have been a social driver for the invention of pottery. "People were gathering together in larger groups and you needed social activities to mitigate against increased tensions," he told BBC News. "Maybe those potteries were used to brew alcohol. "It used to be thought that the beginning of pottery was associated with agriculture and sedentary lifestyle," he added. "Yet here we find it 8,000 years or more before this transition. This is a very puzzling situation." The archaeological team estimates from fragments of the bowl that it was 20cm high and 15-25cm in diameter. Prof Bar-Yosef is keen to discover what these ancient people were cooking 20,000 years ago. He believes that whatever it was it was either steamed or boiled in the bowl. "It's probably not the first wok," he said. "Cooking with oil began later. "We think it was used for cooking with water, so it is more like a caldron".